The Coconut Road was built in the end of the 1960s. It’s the first stretch of the ecological road BA-099, with 53km, that cuts the North seashore of the state. The road starts in the surroundings of Salvador International, cutting the cities of Lauro de Freitas and Camaçari. It’s the oldest ecological road of the country, inaugurated in 1993, when it was extended from the Green Line, which goes from Praia do Forte up to the settlement of Cachoeira do Itanhim, in Jandaíra, through an extension of 192km, until the border with the state of Sergipe. 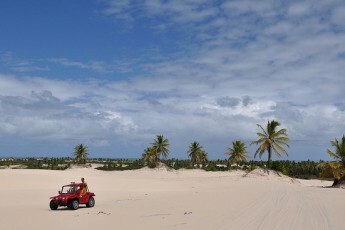 The road revealed areas of primitive nature wonders in Bahia’s North seashore. Its design allows the socio-economical integration of various neighboring cities, improving the development of the region, specially in the leisure segment, with a variety of tourism equipment that make it easier for the visitors to explore nature wonders such as the flora, dunes and an extensive hydrographic net. Some antique buildings also became great attractions of the region. Garcia D’Ávila Castle is one of the most important and significant monuments of the Brazilian historical and cultural heritage, located near Praia do Forte. It’s the first big Portuguese building of residential military architecture in Brazil, with characteristics of a medieval castle. Unfortunately, in the 19th century, it was already in ruins and was recorded by IPHAN, in 1938; today it’s under restauration. Its owner, the Portuguese nobleman called Garcia D”Ávila, arrived in Bahia as the royal storekeeper and became one of the biggest landowners in history, with 129 farms that occupied 800.000km², which is one tenth of the Brazilian territory. His domains spread until the states of Piauí and Maranhão.